To explore the concept of Qiblah, we discussed how we stand in a specific direction while we pray. We stand with our face toward the Holy Kabah, rather than with our back or side to the Holy Kabah. We talked about how if we stand facing the Kabah, we are standing in a way that if we walked straight, straight, and more straight, we would reach the Holy Kabah right in front of us. If we stood in the wrong direction, we would not be able to find the Holy Kabah. After that, I introduced the string. The string represents an imaginary string that extends all the way from the Holy Kabah all the way to each of our homes. Whenever we pray facing the Qiblah, we have our own personal string connecting each and every one of us to the Holy Kabah. What an compelling visual that is to imagine: the Holy Kabah in the middle, with millions of strings extending from there to each of our homes, connecting us all to Allah (SWT), every time we pray. 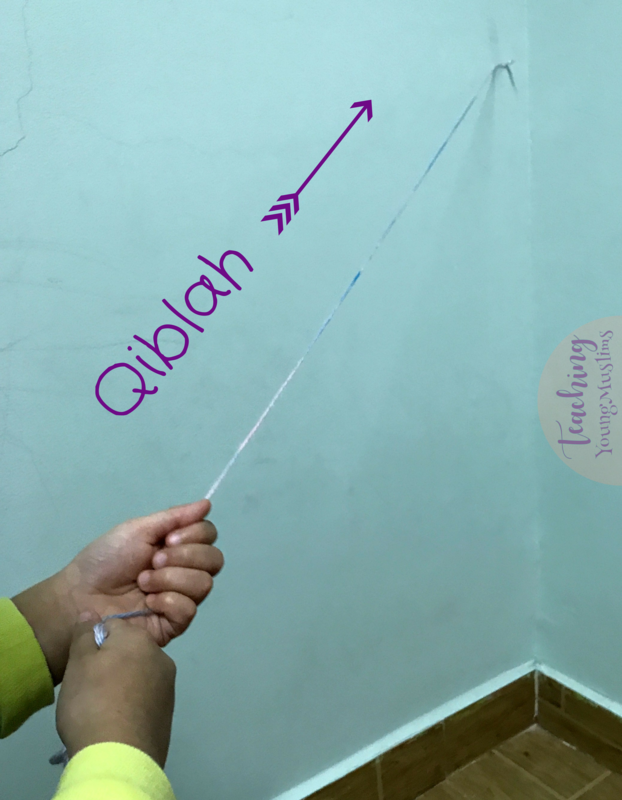 For our activity, I taped a piece of string to the wall, representing our connection to the Holy Kabah and Allah (SWT). When we are standing facing the Qiblah, we can hold the string to remind ourselves that whenever we pray, we are standing in front of the Holy Kabah, in front of Allah (SWT), along with millions of Muslims throughout the world. I hope you found this activity helpful to discuss the Qiblah! If you loved this and want to make sure you don’t miss out on any future posts, subscribe to receive all posts by email on the side! You can also like my page on Facebook and Instagram. All the links are on the side!